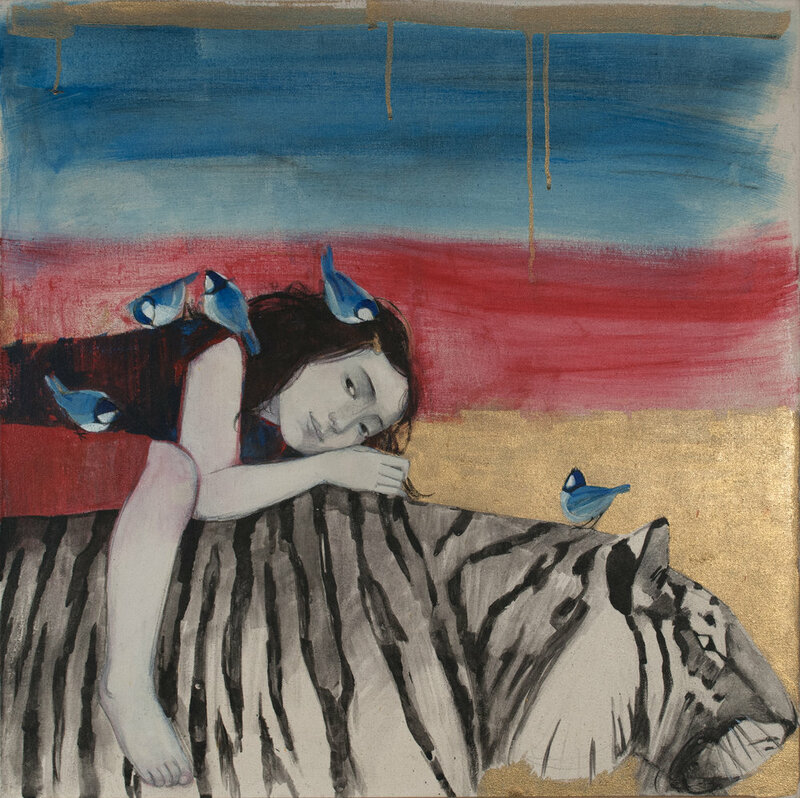 The artwork and imaginings of contemporary Scottish artist Lucy Campbell. Well, I see that I had an unpublished/unfinished blog post from back in 2016... and before that there was a post from 2015... clearly not really rocking it on the blogging front. I admit that the visual immediacy of Instagram is much more my thing. However I have some exciting news and as I have actually got around to publishing my new collection in the 'latest / unsold work' section, I feel it is definitely time to do a written post! When I set out to get together a body of new work for this show last year, I didn't have a clear idea of what would unite the work, I simply felt 'ready' to put myself out there again in a way I hadn't for a number of years, largely because I had been undergoing a very long and painful orthodontic procedure, including major surgery with a long recovery period. My working process had to change to allow me to take better care of my health, and the date of the surgery itself was a chimeric thing which proved impossible to pin down and therefore impossible to plan around. Only with the benefit of hindsight can I see how much it impacted on how I worked. It is wonderful - thrilling, invigorating, self-indulgent even - to work towards a big solo show, although it is also utterly terrifying, stressful, financially ruinous and a threat to close relationships and mental health. Of course I had to concentrate on a more gentle, 'safe' practice whilst undergoing something that was so challenging to my health. So last year I was finally feeling through the other side of it, stronger and braver and able to throw myself into the creative challenge again. Only I had all those other things going on, the things I need to do to keep the wheels of family life oiled and food on the table, and the weeks and months sped by and the two or three paintings I had begun for my new collection were somewhat weak and lacking authenticity. I began to despair and doubt, seriously, whether I had it in me. And I realised also that the style of painting I had been developing, whilst accomplished in its own way, was limiting me - and more importantly, it was incredibly time consuming and there was not a snowflake's hope in hell of getting enough work together to create a credible solo show if I kept on down that track. I was also feeling out of touch with my work, like I was heading down the wrong track, one of those tracks that either tapers out in the middle of a bog somewhere or splinters off into myriad different possibilities. I didn't have time for that. Or for doubt. The joy/terror of the deadline was upon me. It was a make or break moment as it always is with deadlines. My only option was to follow my joy and go wherever it would take me and FAST. Painting quickly and loosely, being liberal and bold with colour, daring myself to work intuitively rather than trying to have it all worked out beforehand, was where my joy was taking me. Of course much of my life nowadays revolves around family, and I decided to turn my attention to the young generation of my own family for inspiration; this is how this work began. One day I read a quote on somebody's Instagram post which was something along the lines of "you are the sky, everything else is just weather" and that too began to feed into the mix. I felt the need to spread my wings creatively and also as I painted my children and my sisters' children, trawling through photos of them over the years, seeking little kernels of inspiration, I was aware of how fast the time goes, how soon it will be that their time of innocence, their sojourn in the 'forest of first encounters', will begin to taper into adulthood, and they too will be spreading their wings. I wanted to capture that sense of the magic of their souls before "wonder no longer animates"; and the sense of pilgrimage/migration from one season of life to another. For more info on Lucy's upcoming solo show, an invite to the Private View or to have a catalogue sent to you, please contact the gallery directly.